MOWAH (JEBEL).—Hill near coast at bottom of Gulf of Bahrein. with Ejman. Habitat near Katif. name in Oman and territory of Truoial Chiefs ? by garrison if intending to retain possession of Bidaa. same as Naaijah above ? powerful tribe of the Katar peninsula. NASAIMEER.—Place in Katar or inland from it. any new settlements to be established. Ashiraj. Inhabited before 1856 by about 150 Utoobees. it had about 100 A1 Bu Kuwara and Utoohee inhabitants. sweet springs and some wood. Lies a little south-west of Katar Peninsula. account of their treatment by Jasim, Chief of Katar. west of Katar Peninsula. Is it near bay of same name ? SALWA (DUHAT).—Bay, forming south end of Gulf of Bahrein. ed, or pretended he wished, to settle herein 1883. SEHALEEYA.—Place about 1J hours* distance from Bidaa southwards. SHAKAB.—Port (?) between Bidaa and Wajbah. 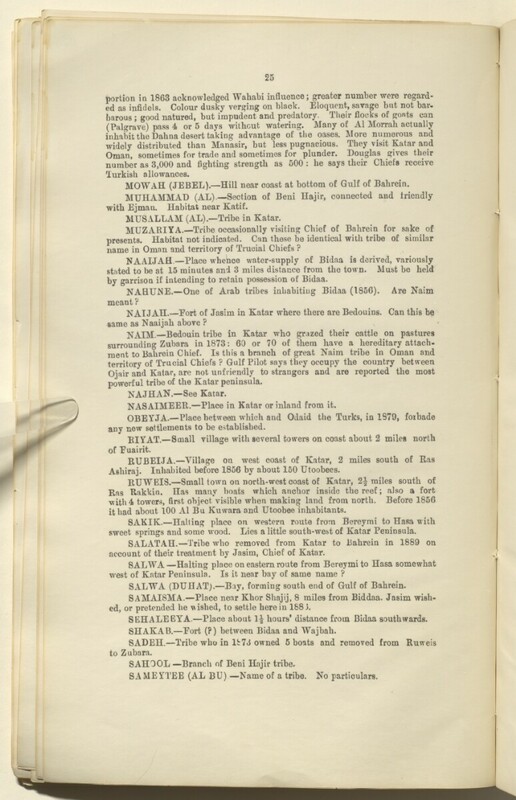 SAHOOL —Branch of Beni Hajir tribe. SAMEYTEE (AL BU)—Name of a tribe. No particulars.